A Pattern in the Primes Factors? A Pattern in the Prime Factors? A while ago I discovered a unique magic square that adds up to 30 in every direction. 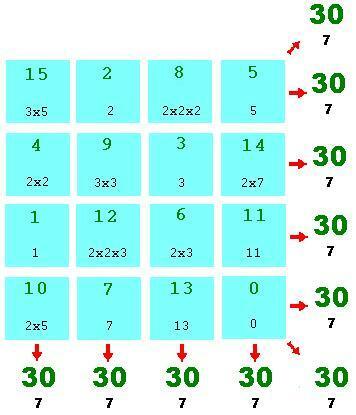 Unlike most magic squares it includes the zero. I was not necessarily looking for a magic square, it was discovered accidently through my study of binary permutations. You can have a look at the original page here. Much later I noticed that the number of prime factors along each of the lines of the magic square equalled 7 in every direction. The possible exception to this involves the three lines that include the zero. If the zero is seen as a special case counting as a single prime factor "0" or as 3 prime factors "0x0x0" then the 7 value for the number of primes holds true for every diection. I believe that this magic square is only one in an infinite series of magic squares or n-dimensional cubes that all exhibit this prime factor property. The next in the series is either a 0-63 magic cube or possibly an 8x8 magic square using the numbers 0 to 63. Does this represent anything new and useful? If you have any questions, criticism or suggestions then please do not hesitate to contact me.